PAPERecordings has hooked up with Dave Connally aka Daco, one of Manchester’s best-kept secrets for a four track EP of pure class. Daco has been a cornerstone of dance music in the North since the early 90s through his work with Zed Bias’ Phuturelounge, Jonny Miller’s broken beat label Jus’ Listen and The Unabombers Elektrons project. 2010 will see the launch of his own Magnetic Recordings and debut album. Always in league with the thrill of exploration and the genre ‘good music’, DACO’s pace, depths and decades of influence endlessly journey through jazz, soul and disco, funk, electro and house. The Aquarium EP mixes up a heady brew of jazz, soul, house, breaks, afro, techno and garage for four amazingly produced timeless tracks. Opening track ‘Aquarium’ is 4/4 roller that slips in to the easy side of jazz with gorgeous filtered strings and vocals with a groove aimed at making hips shake and feet shuffle. Next up Feel Your Love has broken beats holding down a deep as your feet bass. Subtle washes and Sarah Howard’s’ gorgeous vocals ooze class. Something For You has been out on vinyl and now gets a digital release. Full orchestral instrumentation, horns, flute, percussion and live drums provide a latin groove that pops and drops, coming off like a big band floor-filler with that all important heavy bottom end. Finally, Play Your Mind is deep music for the head with Rhodes, broken drums sat back in the mix and plenty of SFX. Radioslave : Love “Aquarium”…super dope track…10/10! Kev Beadle : Very Strong EP, will be all over this for definite. Leo Zero : Loving Aquarium – lov-er-ly swing on that ! Classy lounge vibes will be whirling on the warm up sessions for sure. Fred Everything : Nice, Aquarium is sounding very old Paper! Nice EP, very musical. Red Rack’Em : This is great! I have always liked Daco’s work and this is no exception. Really jazzy and accomplished stuff – will be massively supporting this on the Smugglers Inn Radio Show and at gigs. Nick Holder : The whole EP is fire! Ralph Myerz : Something For You is beyond up my alley!!!! That sounded somehow wrong, however, the point is…REALLY like it! Chris Coco : This is a happening EP of extreme gorgeousness. Laurent Garnier : Beautifull spaced out disco release, will playlist on the radio. Balihu : Very nice tunes! Fred Deakin (Lemonjelly) : Just loving this, I am a Paperhead! DJ Deep : VERY NICE!! 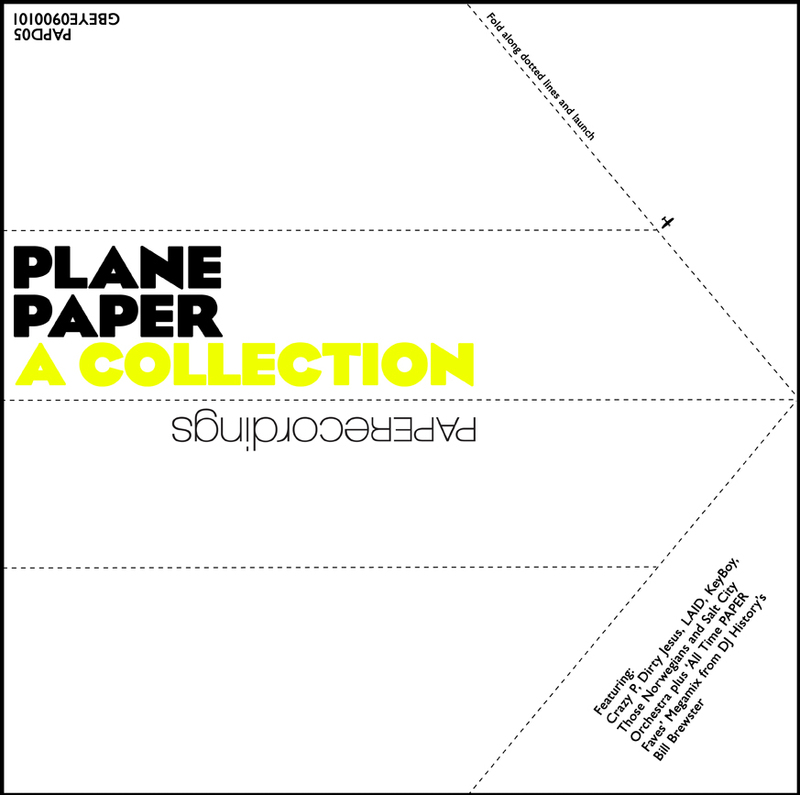 PLANE PAPER: The Best of PAPERecordings is available now in OURSHOP before general release in OURSHOP this week only. It’s a collection that presents new and old catalogue treasures available to download for the very first ever time, PLUS an exclusive nu-disco remix of Downtime by Flash Atkins. PLUS a bonus DJ mix by DJ History’s Bill Brewster of his favourite paper tracks. Our very own Pete Jenkinson tells it how it is at the Hive Surgeries in Blackburn. There will also be representatives from North West Vision & Media (NWV&M), Business Link North West (BL: NW), and Lancashire County Council’s Creative Lancashire team, to tell you more about the support for music industry professionals in your area. https://www.paperecordings.com/wp-content/uploads/2018/12/paper-logo-small.png 0 0 Pete https://www.paperecordings.com/wp-content/uploads/2018/12/paper-logo-small.png Pete2010-03-16 17:26:172010-03-16 17:26:17Our very own Pete Jenkinson tells it how it is at the Hive Surgeries in Blackburn. Here is your one blog stop for all things Snax. Live clips, videos, photos, free tracks and all the latest news. Stay tuned for remix contests, store and more! He’s co-writing and keyboards on Jamie Lidell’s “I Wanna Be Your Telephone” on Jamie’s Compass LP this spring on Warp. In true origami style, our homage to clashing jewels from the past and present – the current PLANE PAPER project; gets some column inches in DJMAG this month. You can download a snazzy booklet to….mmmmmm. The Bill Brewster mix is the best.